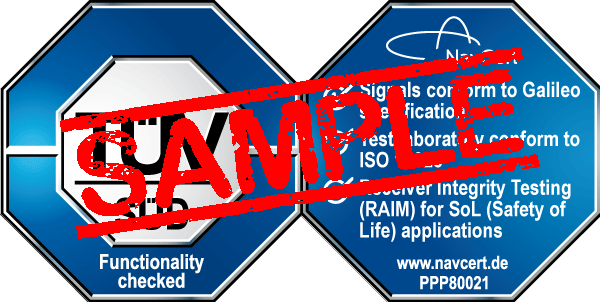 This certification mark is awarded to a ground-based test and development environment for the simulation of Galileo signals in the real world (Galileo test-bed). With the IOV satellites being operational and more satellites just about to be added to the orbit configuration, the European satellite navigation system Galileo is increasingly in the focus of attention. The need arises to test applications which make use of Galileo in addition to GPS under realistic circumstances. Galileo is to be viewed as the European counterpart to the US American satellite navigation system GPS. Within this context the DLR (Deutsches Zentrum für Luft- und Raumfahrt) has initiated a number of projects to develop so-called GATE (Galileo Test Environment) test-beds to create ground-based test environments for the emerging market of satellite navigation products for Galileo. These test-beds support receiver and application developers in their development of Galileo products. This certification mark is awarded within the scope of voluntary testing and certification. In cooperation with the applicant test criteria will be set up before commencing with the testing. The assessment of the test-bed and associated tests are focused on conformity with the applicable Galileo specifications and on the competence and quality of the applicant’s operation of the test-bed systems. Certification test criteria are differentiated between technical and operational requirements. In a Galileo test-bed the generated signals shall be conform to the signals as defined in the ‘European GNSS (Galileo) Open Service Signal in Space Interface Control Document (OS SIS ICD). A ground-based system does have certain constraints affecting the signal structure when compared to a satellite system (transmit stations on ground, not in orbit, therefore near-far effect issues). Nevertheless the signal environment shall be as realistic as possible, so that the test-bed signals correctly replicate the satellite signals and will be correctly received and processed by commercial-of-the-shelf satellite receivers. Further requirements concerning the availability and reliability of the test-bed signals will be considered as well. They will be derived from the test-bed system specifications as wells as from the applicant’s requirement documents. For the users of a test and development environment, e.g. developers of Galileo receiver hardware and software, it is essential that the test-bed is able to reliably reproduce test conditions. For this reason every experiment has to be executed with the respective required quality. The quality of operation will be validated according to ‘DIN EN ISO/IEC 17025:2005: General requirements for the competence of testing and calibration laboratories’ and according to quality requirements from the ECSS standards. Here the focus is on organisation and management, used hard- and software and documentation management. Galileo is a space project that is performed following the rules for space engineering as defined in the ECSS standards. For the installation of the Galileo test-bed the ECSS shall be applied as far as applicable. The focus is primarily on the project management during installation of the test-bed. For this purpose it is validated that the structure follows the ECSS rules (see ESA life-cycles). Furthermore the design and the development shall also be structured according to ECSS. Within the scope of the certification it will be assessed, if the requirements by the client are met and if the documentation is in line with the ECSS standards in form and content. The ECSS standards will be adapted to the characteristics of the specific test-bed (ECSS Tailoring). The validation includes the areas engineering – with the focus on ground infrastructure -, risk and configuration management as well as documentation management. According to contractual agreements between client and the organization chosen for the installation of the test-bed, there are additional requirements outside the test criteria defined by the ECSS standards. These are a specific behaviour of the system, size and coverage of the test-bed, additional functions or similar. These requirements will be assessed within the scope of the certification and documented in the test protocol. Conformity of the test-bed signals with the applicable Galileo signal specifications will be tested within the scope of the certification with tests, evaluation of documentation and audits. Available documentation of the signal structure will be analysed with respect to conformity with the Galileo OS SIS ICD considering system specific adaptations. Document studies will be complemented by recording the generated signal and comparing it to the specification. Frequency, bandwidth, signal strength, signal structure, the navigation message etc. will be assessed. In another test the signal will be recorded with commercial Galileo receivers and the positioning accuracy will be assessed both for static and dynamic mode. Detailed analysis of the signals emitted by the test-bed combined with positioning measurements using commercial receivers allow a credible judgement of the test-bed with respect to the conformity of the signals to the Galileo specifications. Integrity relates to the level of trust that can be placed in a system and is an important part of SoL (Safety-of-life) applications The test-bed allows simulating events which can trigger the integrity alert function on a user receiver (RAIM – Receiver Autonomous Integrity Monitoring). The ability of a user receiver to correctly detect integrity events and display integrity warnings issued by the test-bed will be used.